Elpida Memory, Inc. (TOKYO: 6665), Japan's leading global supplier of Dynamic Random Access Memory (DRAM), today announced that as of the end of July it had started sample shipments of the smallest chip now available in the DRAM semiconductor memory industry. The new chip uses ultra fine-width process migration technology to achieve a circuit line width of 25 nanometers (nm)  . Elpida completed development of this advanced manufacturing process in May and has begun to apply the process to commercial production. The new 25nm process-generation product now being shipped is a DDR3 SDRAM with a memory capacity of 2-gigabits (see product specifications below). A 25nm 4-gigabit DDR3 SDRAM is expected to become commercially available by the end of 2011. These 25nm-process products will be used for PC and server applications. The process will also be used to develop applications of Elpida's Mobile RAM™ for use in various kinds of mobile devices, starting with the growth areas of smart phones and tablet PCs. Special features of the 25nm SDRAM include lower current usage (roughly 15% less during operation, 20% less when on standby) compared with Elpida's current advanced process 30nm-generation products and one of the highest data transfer rates in the industry. DRAM is the indispensable working memory for supporting information processing in personal computers, mobile phones and many other kinds of electronic equipment. In recent years there has been an explosive increase in the need for solutions to instantaneous processing of music, pictures, video and other high-density data. As a result, DRAMs must now be capable of both a faster rate of high-speed data processing and low power consumption. Elpida's new 25nm DDR3 SDRAM is expected to find applications in PCs and in various kinds of servers used in data centers and other facilities that perform information processing tasks on a large scale. Additional probable applications include mobile phones, smart phones, tablet devices, ultra-thin notebook PCs, game consoles, flat screen TVs, set-top boxes and other kinds of digital consumer electronics. 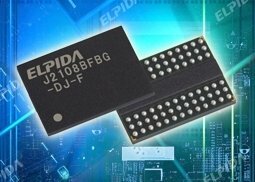 Elpida, which is in the business of DRAM design, development, manufacturing and sales, continues to develop high-density low-power DRAMs using the latest technology. As a leading provider of memory solutions, the company remains committed to providing the most advanced products.